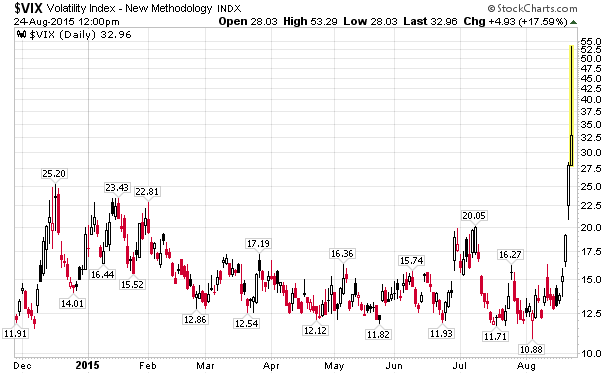 As the equity rout gathers steam across all markets, the volatility measure VIX Didn’t Update for 30 Minutes. For a brief period this morning, anxiety got too high to measure in the U.S. options market. The Chicago Board Options Exchange Volatility Index failed to update for about 30 minutes after the open of stock trading at 9:30 a.m., data sent to Bloomberg show. Trading in the options from which the VIX is derived was too disjointed to calculate a value, its overseer said. In times of stress, traders use the VIX to gauge levels of market turbulence. The gauge reflects the cost of options that are used, among other things, to protect against losses in shares, so its level is viewed to gauge how cautious investors are toward equities. The rout in markets from China to South Africa triggered a record jump in a gauge of options prices on developing-nation stocks as investors purchased contracts to protect against future declines. The benchmark -- called the CBOE Emerging Markets ETF Volatility Index -- more than tripled as trading began at 9:30 a.m. in New York. The selloff in developing nations took a turn for the worse on Monday as Chinese equities fell the most since 2007. The measure jumped 44 percent to 47.88 at 11:03 a.m in the biggest gain on record. 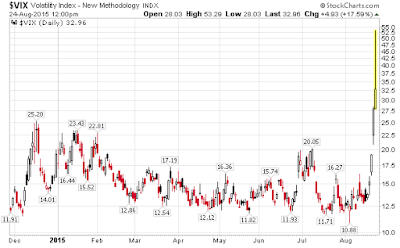 In three days the VIX jumped from 15 to today's high of 53.29 as options prices became too volatile to quote. Wasn't high frequency trading supposed to increase liquidity? I guess it does until it doesn't. When that happens, there are no bids for 30 minutes and the VIX becomes too disjointed for HFT algos to calculate a value.